What does it mean when the highlight of your day was taking a 2 1/2 year old to their first dentist appointment??? - barely having enough time to get 2 girls to eat a cheesestick (which Ana spit in the garbage) and 4 strawberries a piece for breakfast. - not even having enough time to drink 1 cup of coffee... forget about breakfast (although the coffee did make it into a travel cup and even INTO the car). - realizing at 9:15 that I hadn't printed out the dental office paperwork to fill out ahead of time. - Grandma getting to the house to watch Zoe at 9:25 because she also had a rough morning (and our appointment was at 9:40 remember). - getting to the medical office parking lot at 9:37 to find it PACKED and cars circling. 10 minutes later I finally stalked a woman and followed her to her parking spot all the way at the opposite side of the lot at the next building over in the last row. - realizing it was 26 degrees out and I had a 37 pound 2 1/2 year old to convince to walk across above parking lots. - getting Ana's name called quickly for our appointment (yippee)... but getting put in a room right next to a chair where a 3ish year old boy was screaming his terrified head off... which could very easily have freaked Ana totally out since she HATES when anyone else cries and screams or makes any really loud noises for that matter. BUT... to be to be totally honest... it means that Ana was AWESOME at the dentist. The dentist appointment was actually fun and full of laughs from Ana, the hygienist, the dentist and me. That should not have been a surprise with Ana the comedian. (Although she could have gone in totally the opposite direction and been Ana the shy, crying, screaming child. Ya never know.) I also should realize that I have wacky children who actually enjoy doctor appointments, and shots, and dental cleanings. I think Ana totally surprised the hygienist. The woman started asking her all of these friendly warm-up type questions... and I think she expected Ana to just be shy and nod or do whatever normal small children do at the dentist for the first time. Except Ana had an answer for everything. (And if you really have met Ana... I'm sure you can just imagine her answers and tone of voice). I don't even know how to explain how funny she was, although she was totally serious while still being funny. 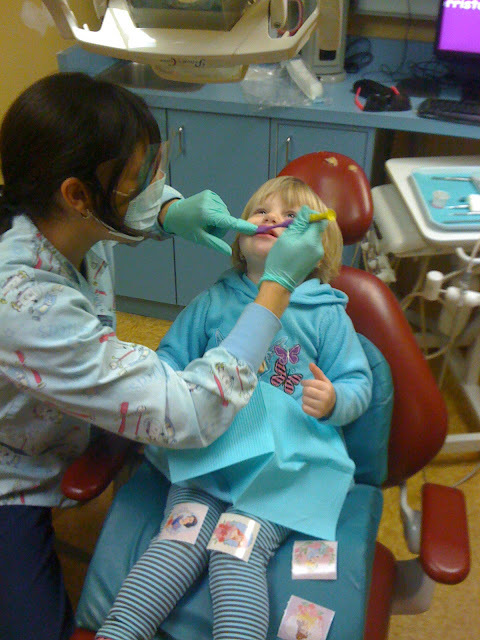 I think Ana may have been about ready to say "Ok lady... are we gonna do this dentist thing or what?" when the topic finally rolled around to teeth. From there she was a pediatric dentist office dream. She turned her head when told to. She smiled into the mirror on demand. She watched in the mirror as her teeth were brushed. The dentist came in to take over. Ana got visibly nervous at the transition from one person to another... and the chair leaning back didn't help too much. The hygienist was great though... she immediately noticed that the nerves set in as the chair tilted... and she pointed out that the prep had gone really well sitting up more. 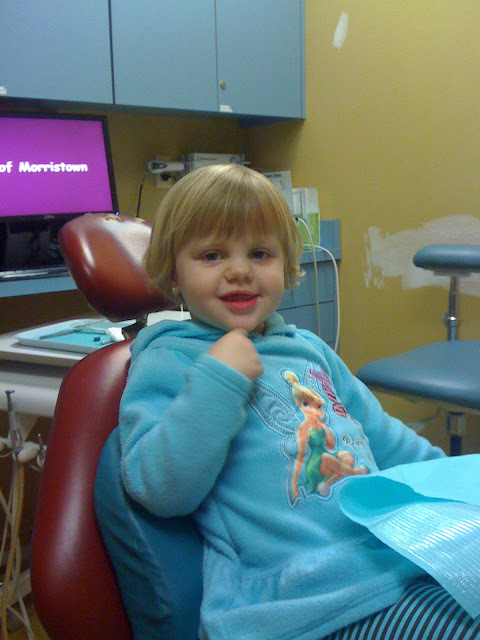 The dentist sat the chair back up a bit and Ana was right back to perfect little patient. 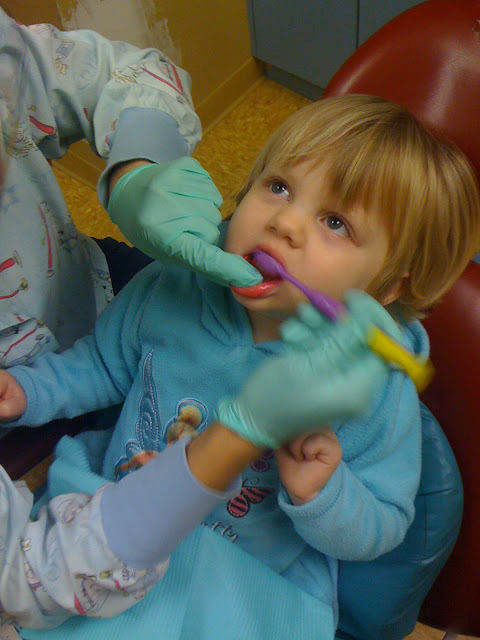 Ana convinced the hygienist that she should get a pink toothbrush in addition to the purple one she already picked out. 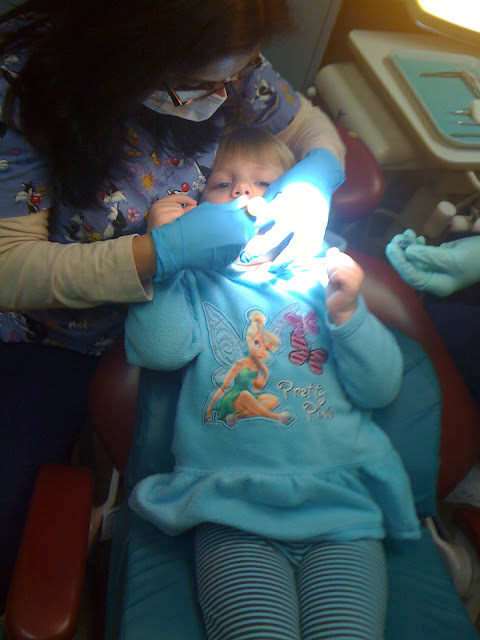 Yeah... a 2 1/2 year old's first dental appointment was definitely the highlight of my day.